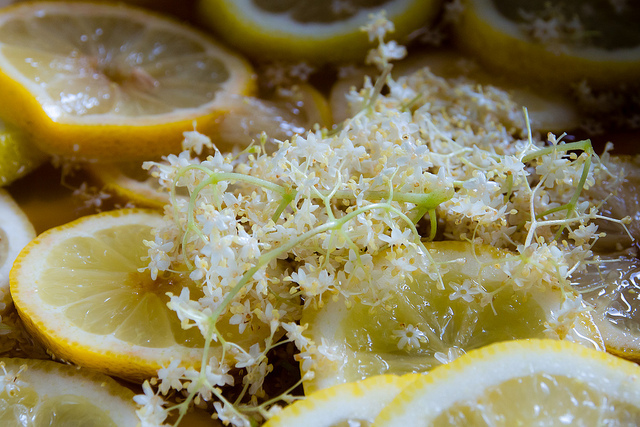 Shake the flower heads out of insects and place them in a pan and cover with 1.5 litres of boiling water. Cover and steep over night. Following day, boil a further 1.5 litres of water and stir in the sugar until it has dissolved. Clean and sterilise a large bucket, which should be of ‘food grade’ quality, and then add the overnight steeped flowers, the sugar water and the remaining 3 litres of water. Slice one lemon and add to the bucket, and juice the other two lemons and stir into the bucket with the vinegar. Cover the bucket with muslin or a clean tea towel and stir occasionally for the first 3-4 days. Once you begin to see bubbles, sieve and bottle up into plastic fermenting bottles. If after 4 days you cannot see any bubbles, add some champagne yeast and wait until you have bubbles. Do not leave more than 7 days before bottling. As the champagne begins to ferment, carbon dioxide will begin to build inside the bottles, so periodically release the gas by partially, and gently, unscrewing the lids. After about a week, your champagne will be ready. Serve chilled with a twist of lemon.